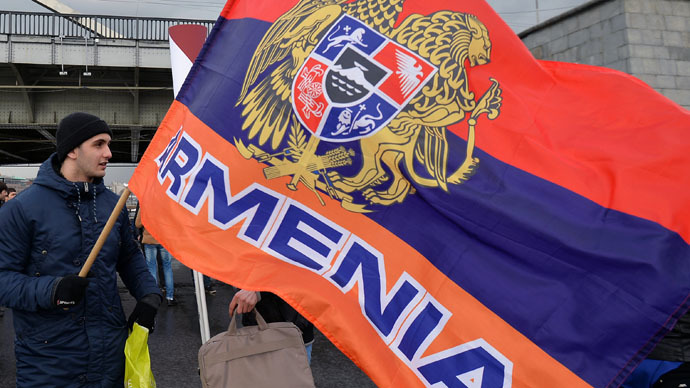 Armenian citizens working in Russia are to be given equal labor rights and social security as Russians following Armenia becoming a full member of the Eurasian Economic Union (EEU) earlier this month, the Russian government has said. “Employers [in Russia – Ed.] have the right to engage Armenian citizens without restrictions for the protection of the national labor market," RIA quotes a government source. In this case, workers from Armenia are not required to obtain work permits for the Russian Federation. The move comes in addition to a Russian-Armenian bilateral agreement that lifts the need for migration registration within 30 days. Armenia joined the Eurasian Economic Union of Russia, Belarus and Kazakhstan after signing the Treaty of Accession in October 2014, and became a full member on January 2. It has become part of the largest common market among former Soviet countries. Free movement of labor is set in the EEU treaty along with the freedom of movement of goods, capital and services. Russia also recognizes education qualifications issued in Armenia. However, qualifications in education, medicine, the legal profession, and pharmaceuticals still need to be checked. "The period of temporary stay of Armenian citizens and their family members in Russia is determined by the duration of their employment or civil contract," Russian Cabinet members said. If the contract is terminated ahead of schedule and the person is present in Russia for longer than 90 days, he or she has the right to sign a new contract within 15 days without departure. The Cabinet explained that the principle of Armenian workers’ social security, except for retirement, is the same as for Russian citizens. "Pension security for workers from Armenia and their family members is defined by the laws of their resident country, as well as by a separate international treaty between the member states of the Eurasian Economic Union," they added. The EEU was established on the basis of the Customs Union of Russia, Kazakhstan and Belarus and began functioning on January 1, 2015. The Presidents of Russia, Kazakhstan and Belarus have also signed the treaty for Kyrgyzstan’s accession into the EEU. It is now in the process of adapting its national legislation to the requirements of the Customs Union.